Toneaphone, LLC releases multiplayer basketball game and fighting game-themed voice changer on the iPhone/iPad simultaneously!! Arcade Basketball Blitz Online™ is a unique twist on a traditional game. Voice Transform and Share is a fighting game-inspired voice changer. Both projects took several months to develop, and began months apart. However, both projects were ironically completed within a week of each other. Toneaphone seized the opportunity of finishing 2 mobile applications back-to-back, and decided to release them simultaneously. Most Developers would advise against releasing 2 mobile applications within a month of each other to avoid cannibalizing. However, there are promotional advantages to owning multiple applications as well. A dual release was especially beneficial to Toneaphone because both applications are ad supported, and the banners/interstitials used to monetize within those apps are also customizable for House Ads. House Ads are not only free, but they allow both apps to cross-promote and attract a wider audience of users in a shorter period of time. Arcade Basketball Blitz Online™ currently ranks in the Top 100 Sports Games in iTunes, and continues to rise in the charts. Although Voice Transform has not surged as quickly, user downloads are increasing daily, and will continue to grow, especially as long as other Toneaphone applications rank in iTunes. 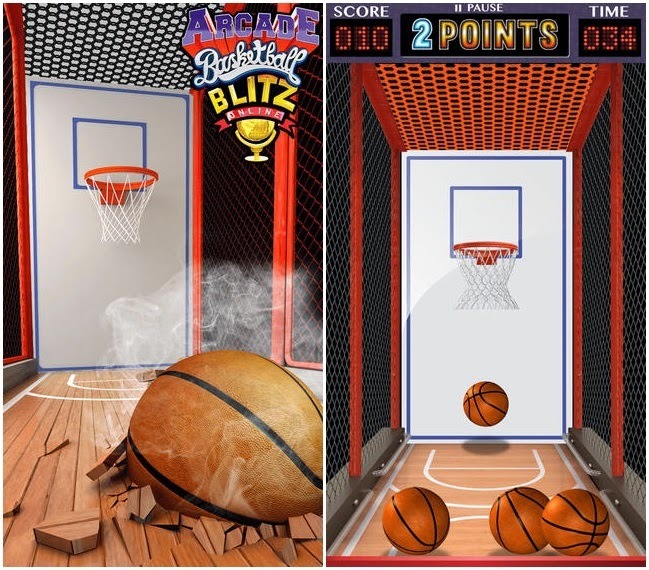 Description: Arcade Basketball Blitz Online™ brings the excitement of the live arcade game to mobile! It’s basketball like you’ve never seen before — featuring beautifully rendered HD graphics and realistic physics, this game will be sure to knock your socks off!! Play against the timer or a friend in an all-out shootout, Arcade Basketball Blitz Online™ ™ provides hours of entertainment! Don’t expect the proverbial, easy-to-score, boring and fluffy basketball game, but a rather much more challenging one instead (like actual arcade basketball). Intuitive and realistic physics make every round an utterly immersive experience! Ultra-realistic graphics that will blow you away, Arcade Basketball Blitz Online™ ™ captures the essence of the classic game, and gives the feeling of being at an actual arcade. Gym: Reminiscent of the classic arcade game the Gym is minimalist yet very entertaining. Park: The essence of street ball juxtaposed with a playground aesthetic make the Park special. Beach: Drift away and have some fun in the sun at the Beach! The sand, palm trees and steel pan will take you on a mini vacation every time. Neon: Lighting effects out of this world, the Neon stage glows vibrantly and radiant sparks flail throughout in spectacular fashion. Inspired by the hit “Vs. Mode” games in the 90’s, Voice Transform and Share takes a very unconventional thematic approach with features including Character Selection screens and weaponized microphones. Record your voice, change it, then save or share it via What’s App, Facebook, iMessage or Email for FREE!! – Add photos to your voice recording and make awesome videos to share on social media! Gary Carr is the Owner of Toneaphone, LLC, and a Graphic Designer by trade. Producing over a dozen iOS/Android applications since 2009, Gary has designed all graphics in every application he owns by himself. His newest title, Arcade Basketball Blitz Online™ was just released, and has been gaining traction ever since.